The piece is 6 minutes long. 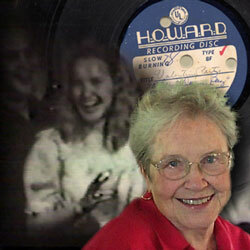 It consists of KBP's interview in 2005 and cuts from her records. No other audio was added. Background. Kathleen's family owned Barrett's Market grocery store and All Inn tavern on the corner of Rowan and Ridge in north St. Louis. The large basement of the building was used for parties. At the time of these recordings Kathleen lived in the apartment above the store with her mother and step-father (Catherine and Ewald Curran) and her brother Bill Barrett. Her sister Mary lived nearby with her husband Lester Hohmann and their two young children. Her brother Bob had been drafted after Pearl Harbor and played saxophone in the Army Band, but was killed in an airplane crash in May 1942. Twenty-five records were preserved. The first of these recordings was made at the end of a long New Year's weekend, Jan 2, 1943. Recordings continued at assorted Halloween, Valentine's, Christmas, and welcome-home parties through 1946. Recording device. Kathleen's machine existed in that blink of time after the first commercially available electrically-recorded disks and magnetic tape. 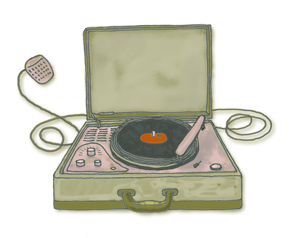 The recording device was a portable turntable in a "snakeskin" case. An innovation up from the hand-cranked acoustical Victrolas, it was electrical. This "home disk recorder" cut analog grooves direct-to-disk (see disk manufacturers below). The brand name and model for Kathleen's Machine is lost in time, but we believe it was a Wilcox-Gay (see David Morton note below). Howard Recording Disc, Howard Radio Co, Chicago. "Slow Burning"
Duodisc Aluminum On label: "Use Duotone Cutting and Transcription Needles for Best Results" Lacquer on aluminum disk. Crosley Home Recording Disc, The Crosley Corporation, Home of WLW, Cincinnati, Ohio. Lacquer on metal. The Recordisc Corp, 395 Broadway, New York City "Instantaneous Recording Blanks. Type N1, 1941. Slow Burning" and "Type Professional, copyright 1942." Can be recorded inside out or outside in. 11.16.10 Kathleen's Machine: Home Audio Recording in the Days Before Tape was licensed for broadcast by REMIX, a 24-hour noncommercial public radio channel distributed on XM 136 for satellite radio, offered as HD/broadcast for local noncommercial radio, and simulcast on internet/mobile.